Charles McColl was a shipyard plater and therefore exempt from military service but he voluntarily joined the Army on 7 September 1914. 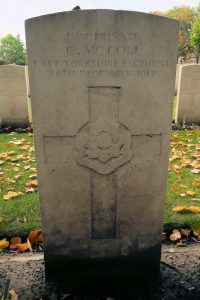 He enlisted into the 11th East Yorkshire Regiment in 1914 and at the end of 1915 sailed to Egypt before the battalion was recalled to the Western Front. In September 1916 his unit had been holding the line near Neuve Chapelle when he was wounded by a shell and invalided home with heart failure. Upon his return to France he was posted to the 4th East Yorkshire Regiment but soon went absent receiving a sentence of 10 years imprisonment. On the 28th October 1917 Private McColl absconded from his platoon which was in brigade support near Houlthult Forest in the Ypres sector leaving behind his rifle and equipment. Four days later he was arrested in Calais after inquiring about a rest camp and stating he was on his way to England. At his court-martial he was not represented and detailed his nervous condition and inability to control himself when in the trenches. No medical examination was ordered. He was tried by Field General Court Martial on a number of occasions but the final, fatal proceedings took place at Brandhoek on 21 December 1917. One of the two members of the court, Captain C.J.A. Pollock, was from the defendant’s own unit and although they were assisted by a Court Martial officer, Captain F.S.A. Baker, Private Charles McColl was undefended and was sentenced to death. He was held in a military prison at Brandhoek then on the eve of his execution brought to the prison at Ypres when he was told of confirmation of the sentence of death. As dawn approached he was manacled and blindfolded with a reverse gas mask and taken out and strapped to a chair and shot. 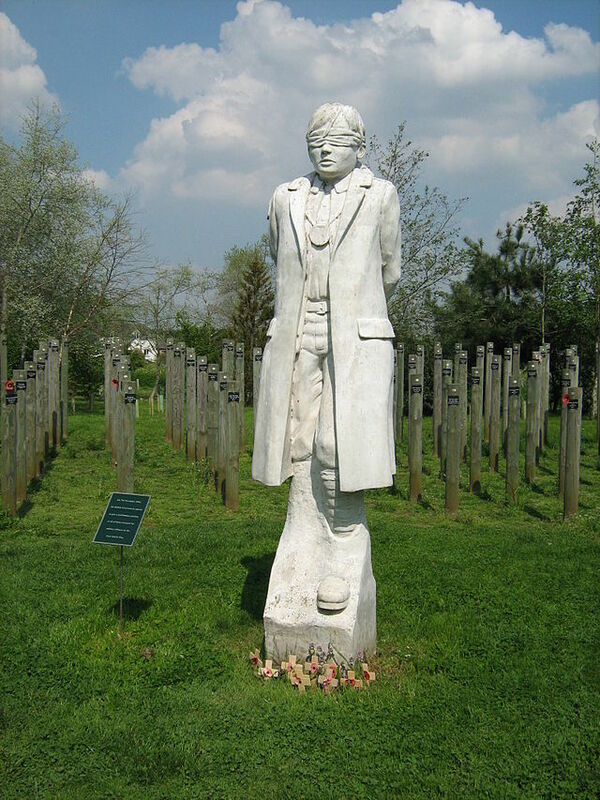 The Shot at Dawn Memorial at the National Arboretum. There is a Tree here for Charles.... a truly sad place.